From Political Art 2012…to Political Art circa 1993. With Jeremy Deller we are going further back. Back to the times in which the mini-Vacuum Cleaner was just growing up and discovering the mischievous artistic potential of the world around him. Back to the days of Ecstasy and Acid House and, even further, to the Miner’s strike and The Who. But although much of Deller’s work may seem focused on popular culture, it also seeks to challenge historical narrative and displace traditional attitudes. 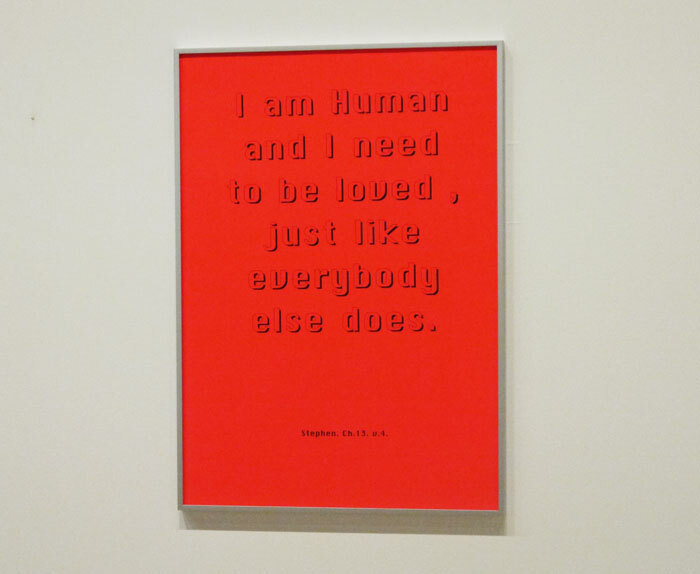 As a visitor to the Deller retrospective at the Hayward Gallery, I had almost no idea of what to expect. 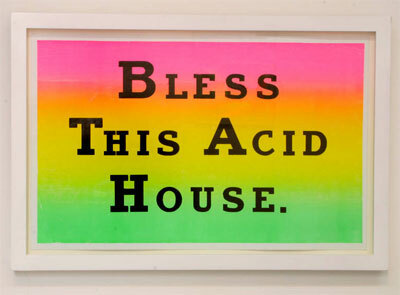 I entered gingerly into the room emblazoned with the poster “Bless This Acid House”, giggling already. Well-placed on the opening door, it set the tone for the entire show; witty, clever and bold. Stepping into the first room was a slightly surreal experience. As a child of the nineties (well kind of – I missed all the ‘sorted for e’s and whizz’ good bits, although I did once find my way to a small rave in some woods. Ahem. 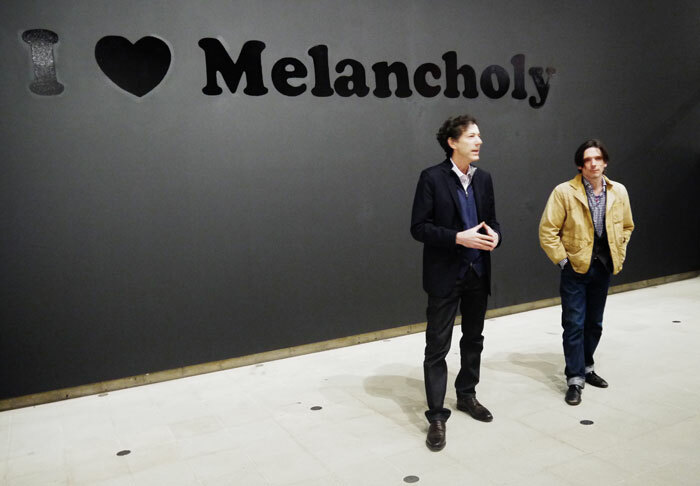 I digress) I found it easy to relate to the objects and imagery in the reconstruction of Deller’s first exhibition, including the ever so slightly condescending Tate text about how Deller lived with his parents into his late-20s, producing work with his bedroom as his studio. Aha! There may be hope for me yet! His lucky break (every famous person has one) came through meeting that oracle of modern art, Andy Warhol; the androgynous 60’s Midas with whom a few hours spent would imbue you with a body pumped by liquid creativity. There are echoes of Warhol here. The spoof exhibition posters, promoting a Keith Moon retrospective (can we have that please? 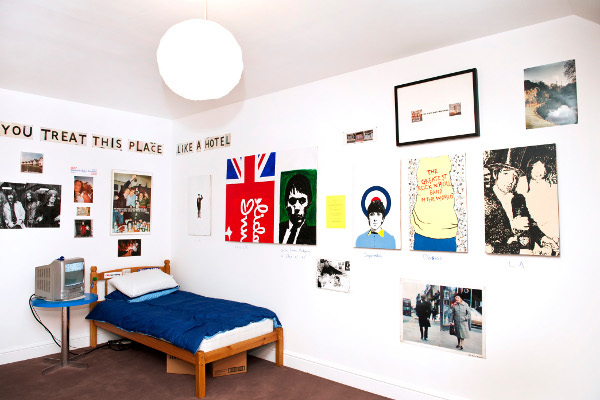 ), the music videos and bright twists on slogans; a lot of Deller’s work is heavily influenced by Pop Art. But then, you can see so many influences in his work it almost deems it impossible to pinpoint any key figures. I was struck by the extensive range of materials, formats, viewpoints, and concepts he explores and even spotted what looked like a tinge of land art à la Andy Goldsworthy, in Barbeque Summer. 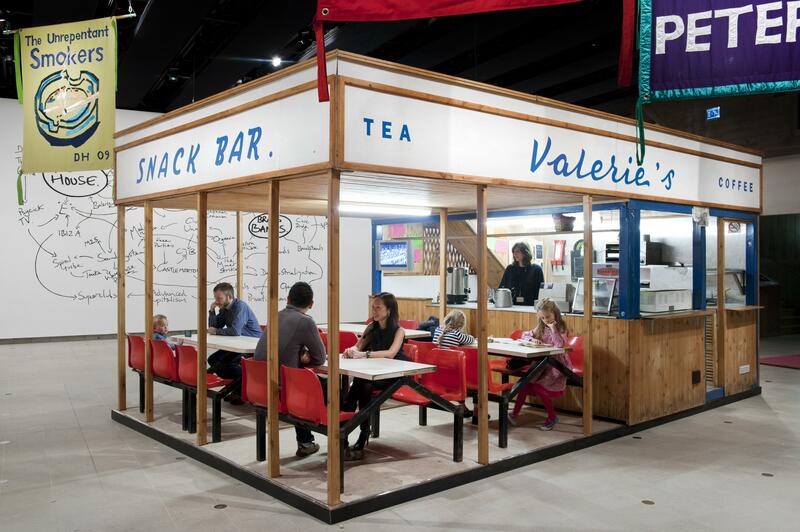 In contrast, Valerie’s Snack Bar, where you could go for a free cup of tea, placed you within the art object itself. You were the viewed, as well as the viewer. It felt a bit like stepping inside Deller’s mind; into a memory. Or into ‘an OAP youth club’, as Deller put it. 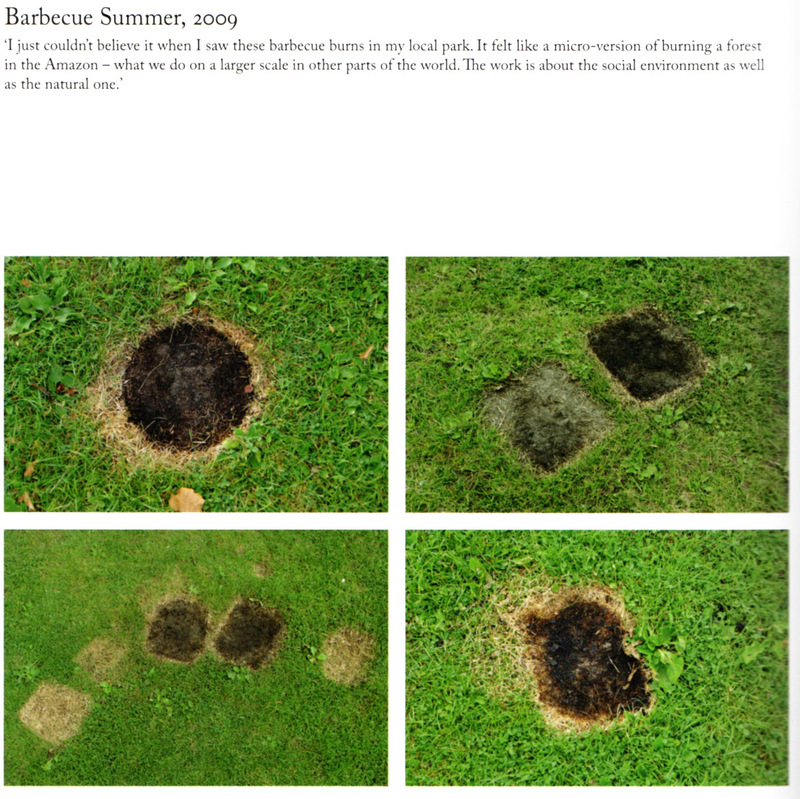 Jeremy Deller – Barbeque Summer, 2009. It is common for an artist to find a single style and to veer only marginally from that style throughout their whole career. Deller swings violently from performance art to interventionist to painting to photography to documentary and on. His work is infinitely entertaining. It is also very funny. I admit that I laughed out loud as a short film explained his project to develop a hand signal language for the middle classes to rival that of the gang culture, amongst others. Thumb, forefinger and middle finger touching and pointed upwards translates as ‘Antiques Roadshow’, or just ‘money’. It was a bit like seeing a visual representation of articles written by David Mitchell or Charlie Brooker. Hilariously witty, but with a message. In this case, a clear, common sense message about acceptability and unacceptability and our ridiculous societal structure that dictates which is which. Banners in the style of biblical quotation contain Bowie and Nirvana lyrics, credited with ‘David c1 v2’ , and a large wall painting charts the links between brass bands and acid house. Acceptable and unacceptable. Transposed and juxtaposed. This theme is continued in his documentary-style works on the miner’s strike and the Iraq war, which take on a more sombre and serious tone. 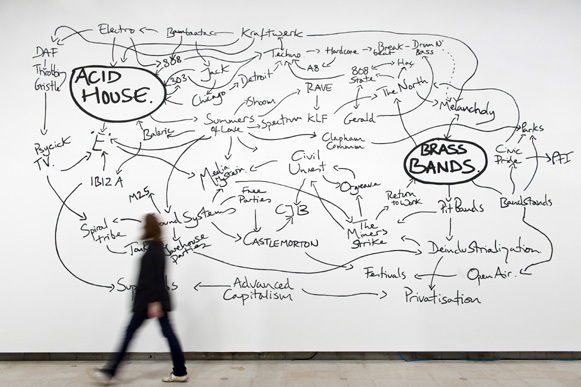 Deller explores the concept of history as a living thing for us to engage with and to delve into. 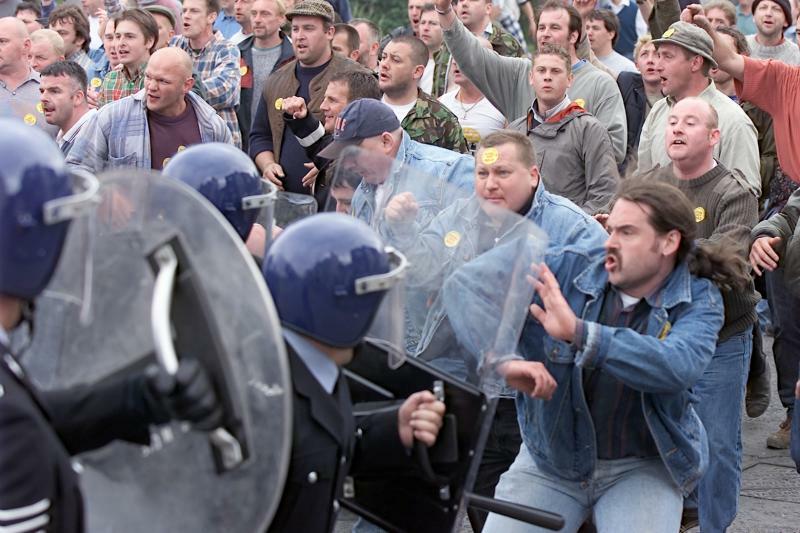 His recreation of the Battle of Orgreave is inspired and poignant. The layout of the project takes us through the written history, factual timelines, contemporary clippings and culminates in a fascinating film documenting the event and his discussions with people who were there. 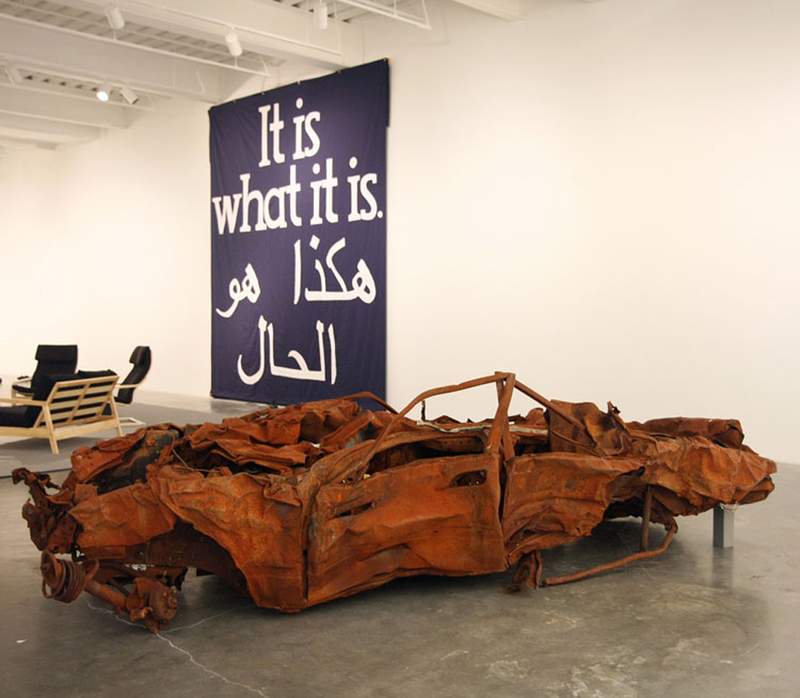 His exploration of conflict and abuse of power continues through ‘It Is What it Is’, a powerful and moving record of Deller’s journey across America with a bombed out car from Baghdad. The general impression is of a man who celebrates life with humour and insight. It is an impression of a thinker of the most important kind,. A social thinker. Someone who looks and sees and cares and comments on what is happening in the world around him. I see the same angry, independent, anti-authoritarian attitudes in his work, as I do in the youth of Britain creating protest art in 2012. The message is of life, experience and freedom vs humdrum, hierarchy and slavery. The message is the same now as it was back in 1993. So in the words of that 90’s anti-hero Renton – choose life.